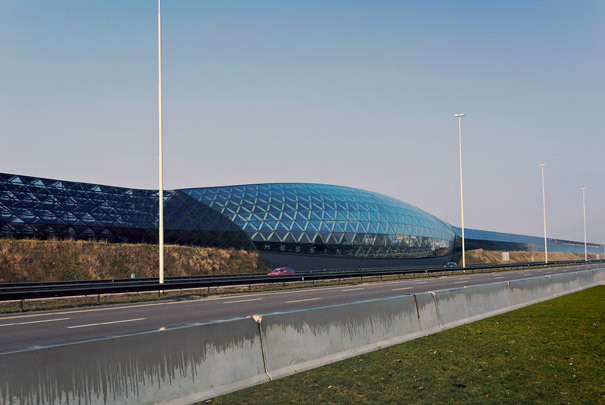 The Acoustic Barrier along the A2 motorway includes in its one-and-a-half kilometres an industrial building, the Cockpit. This contains a car showroom, an appropriate duty and one exploiting the building's attention value. The position of the Cockpit's greater volume and the sinuous lines of the barrier are redolent of a snake with its recently swallowed prey. All components, including the 40,000 differing steel nodes and the 10,000 differing triangular glass panels, were generated by a computer program, produced as one-offs in a factory and assembled on site like a construction kit.